Ten years ago, the Fed launched what many refer to as the world’s biggest economic experiment in the history of central banking with its quantitative easing program. With the U.S. financial system in extreme turmoil and the Fed funds target rate already near zero, the U.S. Federal Reserve was forced to take unprecedented measures in order to provide much-needed liquidity and lower interest rates even further. The central bank’s intention with QE was to buy government securities from banks and other financial institutions and have the money from those purchases loaned out in hopes of spurring business activity. Between 2008 and 2014, through QE1, QE2 and QE3 the Fed purchased trillions of dollars of government bonds and mortgage-backed securities inflating its balance sheet from $900 billion to $4.5 trillion. The Fed eventually began cutting back on its bond buying in December 2013 and ceased all buying in October of 2014 when they had enough confidence in the economic recovery to withdraw some support. Fast forward three years to the Fall of 2017. The global economy is experiencing synchronized growth for the first time in many years and our memories of the Great Recession have begun to fade. 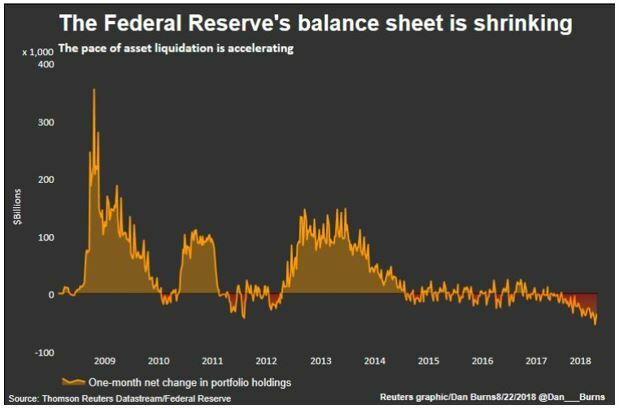 It’s at this point the Fed decided to embark on a new major experiment, unwinding its quantitative easing program and begin shrinking its balance sheet, known as quantitative tightening. Think of quantitative tightening as reversing the process of quantitative easing. Instead of pumping money into the financial system, the central bank is now draining money out by allowing up to $50 billion of its Treasury securities to mature each month without replacing them. Increased volatility across financial markets – by removing liquidity from the financial system, many expect the pick-up in volatility that we’ve seen this year to continue. Pain in emerging markets – the Fed’s tightening of monetary policy has strengthened the dollar, resulting in emerging economies having trouble repaying debt borrowed in U.S. dollars. Demand for short-term cash could cause huge swings in rates – as the Fed shrinks its balance sheet and the pressure on bank reserves mounts, there could be a scramble for short-term cash causing rates to spike. With any major economic policy shift, particularly one with zero precedent, doubts and concerns run aplenty; however, there are good reasons for the Fed to attempt to normalize interest rates and its balance sheet. The U.S. economy has made very substantial progress since the financial crisis, including a labor market that is doing extremely well. The fact is our economy is not operating at a crisis level so removing emergency stimulus appears to be a sensible strategy. Sure, the pace at which the Fed raises rates will always be questioned, but at least we’re moving in the right direction. What will Japan or Germany do if we slip into a recession, take rates even more negative? Quantitative easing was a desperate attempt to save our financial system which was on the brink of collapse ten years ago. And although there are still threats today, the Fed’s primary goal of preserving the financial system was accomplished. Let’s hope the Fed’s current experiment of attempting to normalize policy through quantitative tightening will be a successful one, even if it means a little bit bumpier ride for markets.